Today we had the last semifinal that would decide who would face Germany in the final. First half was a very defensive half, with not many chances of goal for either side. Argentina was able to hold possession of the ball for the majority of the half, and control the game. They pushed Netherlands to their own half and didn’t allow them to come out of their defensive zone with the ball controlled. The only few times they reached Romero’s area was with long range free kicks being floated into the box looking for a header from Van Persie. Argentina had the best chances of the first 45 minutes, and a free kick from Messi in the 15th minute of the first half was their best chance to score. For all the possession that Argentina had and control of the game, they weren’t able to really create many chances. All of their offensive plays came from Enzo Perez and Zabaleta using the right wing to break through the wall put up by Netherlands. In the middle of the field was impossible to break through and Messi was kept off the ball and away from the box, which was the best strategy that Netherlands could deploy to avoid going down a goal early. The first half ended in 0-0 score, and everything was wide open for the second half of the game. The second half brought us the complete opposite of the first 45 minutes. Janmaat came in for Martins Indi and it gave some extra muscle to the Dutch midfield. Netherlands was able to retain the ball and control possession, and now it was Argentina the ones pushed into their own half and defending with 11 men behind the ball. Even with all that ball control and possession Netherlands wasn’t able to create much offense with it. Mascherano was a general in the midfield able to stop any attack. 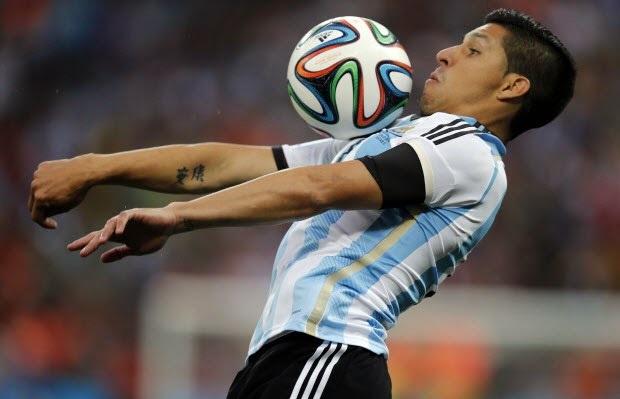 The first good chance of scoring came to Argentina, with a great cross from Enzo Perez in the right wing to a running Higuain that shot wide. He was called for offside so it wouldn’t have counted, but it was a sign that Argentina could put one away in a quick transition play. The best chance for Netherlands came late into stoppage time with Robben having one of his dashing runs and when he was about to finish, who else but Mascherano with a sprawling tackle to push the ball to the end line and give Netherlands a corner. Nothing came from the corner and few minutes later the game was over. They were going into extra time with neither team creating many goal opportunities during the 90 minutes played. The first half of extra time brought us the same that we had already seen in the second half of regulation. These were two very defensive minded teams not willing to give each other any space. Nobody with any real chances of scoring and Messi continued absent from the game. Second half of extra time didn’t change anything. These were two teams more interested in not losing than actually trying to win. It would take penalties to decide the winner. Argentina is going to the final to play Germany. Iain and Pedro had Argentina winning just not by the correct result, but at least they got the winner.